, phase of plant life cycles in which the gametes, i.e., egg and sperm, are produced. The gametophyte is haploid, that is, each cell contains a single complete set of chromosomes, and arises from the germination of a haploid spore. transfer of pollen from the male reproductive organ (stamen or staminate cone) to the female reproductive organ (pistil or pistillate cone) of the same or of another flower or cone. , in botany, reproductive organ of the gymnosperms (the conifers, cycads, and ginkgoes). Like the flower in the angiosperms (flowering plants), the cone is actually a highly modified branch; unlike the flower, it does not have sepals or petals. seasonal allergy causing inflammation of the mucous membranes of the nose and eyes. It is characterized by itching about the eyes and nose, sneezing, a profuse watery nasal discharge, and tearing of the eyes. ..... Click the link for more information. continues indefinitely. The small male reproductive bodies produced in the pollen sacs of seed plants (gymnosperms and angiosperms). On maturation in the pollen sac, a pollen grain may reach 0.00007 mg as in spruce, or less than 1/20 of this weight. A grain usually has two waxy, durable outer walls, the exine, and an inner fragile wall, the intine. These walls surround the contents with their nuclei and reserves of starch and oil. Extreme variations in size may occur within a family, but pollen grains range mainly from 24 to 50 micrometers, with the dicot range being from 2 μm in Myosotis to 250 μm in Mirabilis; the monocots range from about 15 to 150 μm or more in the ginger family, with eelgrass (Zostera) having pollen measuring 2550 × 3.7 μm in a class of its own; living gymnosperms range from 15 μm in Gnetum to about 180 μm in Abies (including sacs), while fossil types range from about 11 μm (one-furrowed) to 300 μm. Most grains are free (monads) though often loosely grouped because of the spines or sticky oils and viscin threads. Compound grains (polyads) are richly developed in some angiosperm families, commonly occurring in four (tetrads), or in multiples of four up to 64 or more. 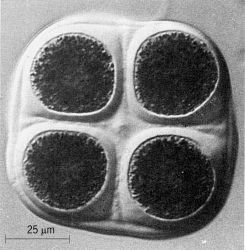 In most microspores (pollen and spore) the polar axis runs from the inner (proximal) face to the outer (distal) face, as oriented during tetrad formation. The equator crosses it at right angles. Bilateral grains dominate in the gymnosperms and monocots, the polar axis usually being the shorter one, with the single aperture on the distal side. On the other hand, almost all dicot pollen is symmetrical around the polar axis (usually the long axis), with shapes ranging mainly from spheroidal to ellipsoidal, with rounded equatorial outlines, and sometimes “waisted” as in the Umbelliferae. Three-pored grains often have strikingly triangular outlines in polar view. Rarely lacking, the flexible membranes of apertures are sometimes covered only by endexine. They allow for sudden volume changes, as for the emergence of the germ tube. They are classified as furrows, with elongate outlines, and pores usually more or less circular in shape. Short slitlike intermediate forms occur. A few families have no apertures, some as a result of reduction of exine as an adaptation to wind- or water-pollination. Gymnosperms may also lack openings, or have one small papilla; most have one furrow, or a long weak area. the aggregate of pollen grains of seed plants. Pollen is rich in nutritive substances (sugars, fats, mineral salts, and proteins), which are depleted as the pollen grains sprout. It also contains enzymes, carotenoids, vitamins, and other biologically active substances that play an important role in fertilization. Pollen is used by bees to make beebread. The viability of the pollen of various species of plants differs. For example, the pollen in lilies retains its fertilizing power for 60 to 65 days; in corn, however, it is viable for no more than two days. Various methods of storing pollen for use in artificial pollination have been developed. 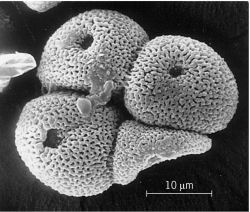 The small male reproductive bodies produced in pollen sacs of the seed plants.